The 27th GTI International event takes place on 4th-6th July at at the Shakespeare County Raceway, Long Marston airfield in Warwickshire. 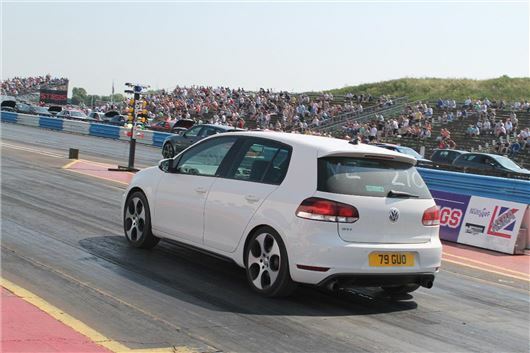 GTI International, Britain’s longest-running and most successful annual gathering for enthusiasts of Golf GTIs and other related high-performance VAG models, is now in its 27th year. This year’s event promises to be the biggest ever, with advance bookings by visitors, clubs and traders up by over 20 per cent. It’s being held for the second time at the Shakespeare County Raceway, at Long Marston airfield near Stratford-upon-Avon, after last year’s event enjoyed a record attendance and earned excellent feedback from press, clubs, trade and visitors. As at last year, the main event will be the quarter-mile drag race. Here, visitors to the event can 'run what they brung', testing the acceleration of their cars against the clock on a real drag strip with world-class timing, watched by a crowd from the 3,000-seater grandstand. The strip will also have demo runs from many of the country’s top tuning companies, as well as members of the Volkswagen Drag Racing Club. One highlight will be Paul Jordan’s four-wheel-drive Scirocco 20VT that can cover the standing quarter in 8.95 seconds, hitting 150 mph. Away from the Sprint, the Show ’n’ Shine and Concours competition, sponsored by Autoglym, attracts hundreds of the best-kept Volkswagens in Britain and Europe, with entries from original and restored concours classics to highly modified and customised cars. Club areas are already well subscribed and many groups are planning unique displays. On top of this there will be a wide range of trade stands, cars for sale, an autojumble and children’s amusements, while overnight camping on site – with permanent toilet and shower facilities, catering, clubhouse and bar with evening entertainment – provides effective accommodation as well as great camaraderie. GTI International 2014 is supported by Milltek Sport, AutoGlym, Shark Performance, Creations Motorsport, Dialynx Performance and Akrapovic. For more details or to purchase tickets please visit www.gtiinternational.co.uk or call 01525 750 500.